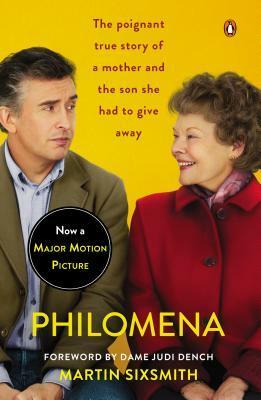 Philomena: a mother, her son, and a 50 year search by Martin Sixsmith is ripe with conversation starters.Today, I want to talk about the Irish babies. There are all sorts of crazy horrible things that go on in our world, and reading about them makes me angry. I have read other instances of babies being taken away from Irish single mothers such as in Jennifer Worth’s Call the Midwife (her trilogy is fraught with tragedy as well). Sixsmith’s book serves up a detailed account of one woman’s real life story of the injustice that was once the norm of her society. The mothers were told over and over that “their scrubbing, wringing and ironing symbolized the cleansing of the moral stain on their souls,” yet 50 years later when Ms Lee returned to the abbey in search of her son, she was told by an 86 year old nun who had been there when the adoption in question took place: “You can find no peace because your sin weighs upon you. Your sin will be with you always and you must make amends for it. Pray to God that He will forgive you, for I cannot.’ “You have got to be kidding me. I have read elsewhere that the labour assigned to the girls carried the good intention of working to pay for the sin committed, so they could be forgiven. But to this nun at least, that was not her intention at all. Was it simply to steal all the free labour they could get their hands on? Likely so. They were getting paid by the government to not only keep the children under their care, but also the mothers! Not only were these girls enslaved for three years, but they had to care for their babies; nurse them, and spend time with them each and every day. As the author puts it, “To allow such love to blossom seemed crueler even than taking the babies away at birth.” I agree. The young women wanted so badly to believe that they would be able to keep their child, that even when they were told otherwise, they clung to the hope of seeing their baby grow up. In Philomena’s case, Anthony, her baby, was once quite sick, unable to settle to sleep. So, she pleaded with the sister to allow Anthony to spend the night with her- one time. She was told: ‘It’s not for you girls to say what happens to the children They no more belong to you than the sun or the moon, Your job is to feed them and work your three years. Then we’ll find them proper mothers who deserve to have children.’” Excuse me?? But what could she do? She was basically in prison and did not want to risk never being allowed to see him again. And then, when the child would reach around three years old, mothers were forced to sign away the rights to the children they had spent so long bonding witth. “The poor girls have been so browbeaten into believing they are sinners that they do whatever the nuns say.”Philomena was told, “‘…You’ve no choice in the matter, anyway. Sign the paper and you’ll be able to leave.’She believed they would never let her out of that room until she signed over her son. Once separated, not only did the mother feel pangs of incredible regret, but the child did as well. In Anthony’s case, he believed for his entire life that “our real mammies didn’t want us because we were bad.’’Can you imagine the toll that would take on your life, if your default self talk constantly reminded you that your mother sent you away? The mother that you think you might remember, but don’t understand why she left you? That could wreak havoc on a child’s mind, a grown man’s mind. And in this case, it sure did. the offspring of fallen women are fated to become rebels and to suffer from complexes analogous to those of certain invalids… Such offspring are destined for suffering and often for failure, No material or social assistance, such as you propose, would be of any use to such people unless and until the rents in the mothers spiritual fabric have been repaired. Sinful mothers are unfit to have custody of they own children, Therefore it would be cruelty to both to leave them together. Again, are you kidding me? First of all, these kids lives were incredibly weighed down by rejection that they carried around for their entire lives. Secondly, how in the world could the life of a child be destroyed simply by allowing it to stay with its loving, caring, devoted, single mother? Thirdly, if the above is scientific evidence, then each and every child should be taken away from every mother, single or not, Irish or not, Catholic or not. Every parent on earth is sinful. Every one of us falls down from time to time. Who do these guys think they are? I can not believe this stuff is actually real. And it is only now that many of the atrocities that occurred, to Irish women and babies, to aboriginals, to african americans, to jews, to people with physical or mental disabilities, and the list goes on and on, are finally being laid out for discussion and mending. I am so thankful to live where I do, at the time that I do, with the family that I do. I was never a single mother, but I am a person living with a disability that was once upon a time automatically subjected to this type of injustice; in some parts of the world, it still happens. And just like these women and their babies, lives are torn apart, never to be repaired. This entry was posted in What to Muse about life and tagged abbey, adoption, babies, Books made into film, Martin Sixsmith, mother, Philomena, reading, sinful, Zinger. Bookmark the permalink.